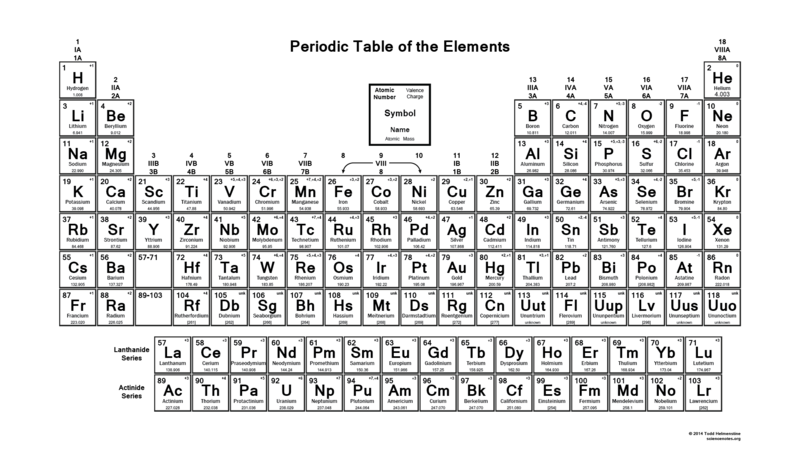 EDIT : This periodic table with element charges has been updated to include corrections to include corrections to the atomic masses of iron and gallium. The improved table can be found at Black and White Printable Periodic Table Chart with Oxidation States. This periodic table contains the number, symbol, name, atomic mass and most common valence charge of each element. The table is available for download in PDF format for offline printing. For best results, choose Landscape and ‘Fit’ for the size option. A color version of this table is available for use with color printers or as a colorful desktop wallpaper for your computer or mobile devices.